It’s been a good year for the Ys series thanks to XSEED, with the release of Ys Seven this summer, Ys I & II Chronicles coming early next year, and Oath in Felghana this month. I’m not sure how unusual of a case this makes me, but Ys III: Wanderers from Ys (the SNES version, to be precise) was actually my introduction to the Ys series, so I was eager to try this version of the game, considering the amount of praise it’s gotten, and hey, portable Ys is always good (the DS version of Legacy of Ys: Books I and II notwithstanding). Let’s see how well this release fares. 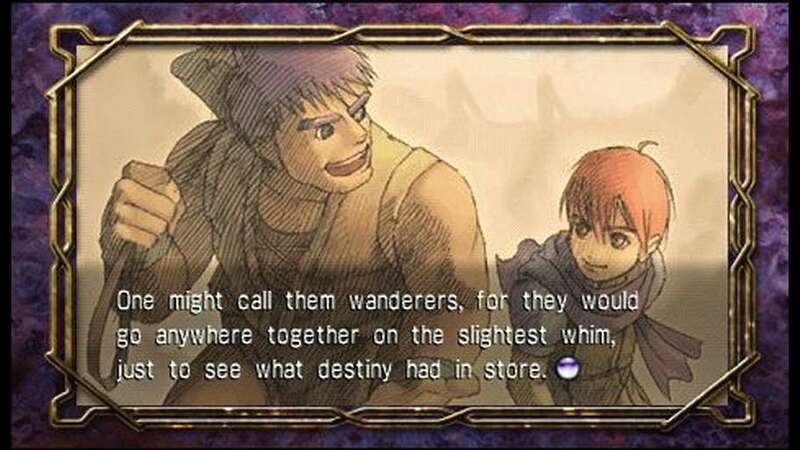 In Oath in Felghana, Adol and Dogi travel to Redmont, Dogi’s hometown. Upon arriving, they find it has been plagued by an increasing population of monsters. 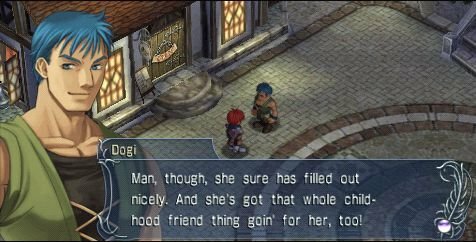 Dogi’s childhood friends, Elena and her brother Chester, are related to this turn of events in some way, and naturally it’s up to Adol to save the day (and town). The story’s on the simple side and probably won’t be the reason you play this game, but it’s enjoyable enough and keeps things moving. There’s now also a diary that keeps record of the events you’ve witnessed thus far, which makes it easy ot remember where you left off. The characters also receive enough personality to make them stand out a bit more. New to this version is a prologue novella that provides some background on Adol and his adventures, told from a perspective of 1000 years in the future. It doesn’t really reveal any new information, but it’s a neat opener and helps draw in the player. The translation in this game is based on the fan translation Deuce (aka Jeff Nussbaum) did for the fanmade patch made for the PC version. It was solid in the patch, and with XSEED’s finetuning it’s even more polished. I have to applaud XSEED for being openminded enough to incorporate a fan’s work into the final product. The transaction was mutually beneficial: Deuce gets acknowledgment and recompense for his work, and XSEED didn’t have to shell out time and money for an entirely new translation. 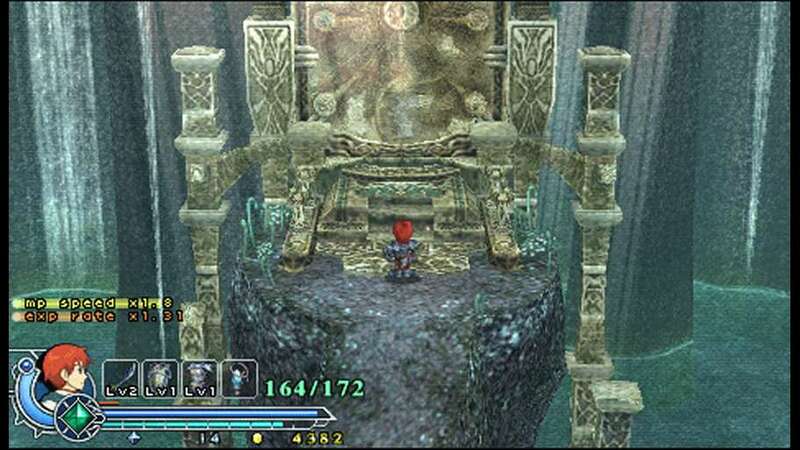 The graphics made the transition to the PSP well, with virtually no load times. It also looks similar to Ark of Napishtim, with elaborate environments and enemies and chibi-styled sprites. The environments are nice to look at – the view on top of the castle, with the sunset, moving clouds, and the way the water ripples, looks especially impressive, and I actually lingered on that screen for a bit just to admire it. The character sprites are less detailed, but they work in conjunction with the 3-D environments. The character art is easy on the eyes, and larger portraits are always used, whereas in the PC version it alternates between smaller and larger portraits. If you equip a whole set of a given class of armor, it’ll be reflected on the sprite. It’s a small touch, but a nice one for the detail oriented. Speaking of details, there’s no longer blood on the ground when you defeat enemies, though for the viscerally inclined they do still burst apart when defeated. The few animated cutscenes look nice, though they really only play at the beginning and the end of the game. Ys is known for the its great music, and this is no exception. The standard soundtrack contains remastered arrangements, with real instruments – you can hear the guitar riffs and strings in a lot of the songs. The faster paced tunes, especially the boss themes, pump you up for battles and dungeon romps, while the calmer ones relax you and set the mood. You can switch between the standard soundtrack and the soundtracks for the PC88 and X68K versions of Ys III if you’re on a retro kick. This was a great inclusion and helps liven up subsequent playthroughs. My personal favorite is the standard soundtrack, though I still switch between the three to hear the different renditions of each track. The premium version of this game comes with a soundtrack CD, and that alone is worth the extra $10, especially since it contains a new track that was added to the PSP version (the desk calendar is also a nice bonus). Full voice acting has been added to this port, and it’s a mixed bag. The main cast is alright, though couple of characters sound rather exaggerated, though in a way it sort of suits them. If the voices bother you, you can turn them off, and there’s even an option specifically to turn off just the narrator’s voice (who describes what Adol says and does). 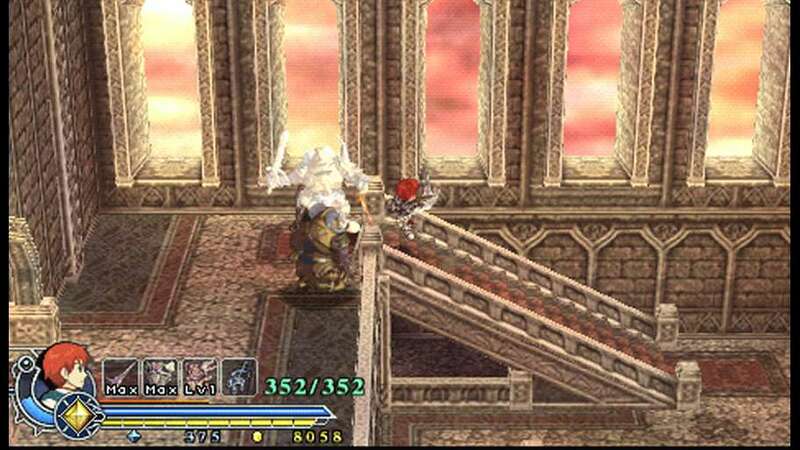 Oath in Felghana uses the same engine as Ys VI: The Ark of Napishtim, so expect a good amount of platforming along with monster slaughtering. The controls are straightforward, with an attack button, jump button, ones to unleash your boost and magic, and ones to switch magic and accessories. Your regular sword combo is actually surprisingly good at getting you a little farther ahead in jumps and when trying to dash to avoid being sucked into a boss’s attack. You can use either the d-pad and analog nub to move. For trickier plaforming and maneuvering on narrow paths, the d-pad felt a bit tighter when it came to moving carefully and precisely, but most of the time I stuck to the analog nub. They’re fairly responsive, and I mostly stuck with the default configuration, though I did have to tweak it to make it work better for me. I actually found it easier to reassign magic to the right shoulder button and switching bracelets on the left. Of course, your preferences may be different, and it’s easy to configure the controls to something that works best for you. As you mow down enemies, they’ll drop various items that either heal you or give you a temporary boost in attack, speed, or defense. These benefits can stack and gain larger multipliers as you pick up more. In addition, the more hits in a row you rack up, the more experience you gain. When you gain a level, your health is fully replenished, which is helpful during long treks in dungeons given that you can’t carry healing items around. You can also forge your equipment, though this costs raval and gold, and the stat benefits pale in comparison to just acquiring the next strongest equipment, at least while raval and gold are more scarce. After you get the best equipment and are swimming in raval and gold, though, it’s much more viable, and the stat boosts do help. Instead of rings that impart various effects like slowing down time and increased strength or defense, you have elemental bracelets which have utility both in and out of combat. Fire can melt ice and light torches, wind (which you’ll likely be using a lot) lets you hover in the air longer, and earth breaks down cracked walls as well as guards agaisnt enemy attacks. Once you find at least one gem for each of them, you can also charge them for a more powerful attack. There’s also boost, which increases your attributes briefly, making you move faster and your attacks hurt more. Double-Boost does the same, but also regenerates some HP (which it didn’t in the PC version), which helps against bosses since you have no other way to heal. The boost meter refills faster the lower your health is, so if you survive long enough you can pull off another Double-Boost and regain more HP. Once you beat the game, you unlock Time Attack mode (which is a boss rush mode), some items in the gallery, and Inferno mode, the highest difficulty. I find it amusing that the mode with “Mwa ha ha” in the description (Nightmare mode) isn’t even the hardest difficulty. To unlock 100% of the gallery, you’ll have to beat the game and Boss Rush mode on all six difficulties. You can also unlock two more boss fights in Time Attack mode, one from beating Time Attack on any difficulty, one for beating the game on Inferno mode. There’s also side quests you can complete, though some are easier to find than others, and they have a limited window of availability (two of them before and after clearing the Abandoned Mines). A couple of them aren’t hinted at much (or at all) in the game itself, so you have to go out of your way to find them. If you load your clear data, you’ll have the chance to buy some abilities to start a new game with, like inheriting your status and armor and being able to forge your equipment to level nine, boosting the speed your magic regenerates and lowering the cost of each spell, and starting the game with your dash or double jump and boost abilities. The number of points available depends on the difficulty you select. Naturally, the higher the difficulty, the more points you have. Being able to carry some things over from one playthrough to another provides incentive to go through the game again. However, to unlock everything in the gallery, you’ll have to complete the game on every difficulty, which might be more effort than people are willing to expend. Those who started on the harder difficulties might find the easier ones tedious, and those who started with the easier difficulties might have a hard time getting through the higher ones. During regular dungeon romps, if you succumb to enemies, you’ll be given the option to start from your last zone-in point. If you’re defeated during a boss battle, the game allows you to try the battle again. It’ll also offer the option to lower the difficulty level for that battle should you fail enough times. If that makes the game sound like a cakewalk, it’s not (unless of course you play on Easy or Very Easy) and you’re given that option for a reason. The key to victory in boss battles is figuring out their attack patterns and strategizing accordingly. They can get frustrating on harder difficulties, but it doesn’t get to the point where it feels like the game is cheating. Gaining a level or two and upgrading equipment (either through forging or getting a new set) makes a noticeable difference if you’re having trouble getting past a boss, but nailing their attack pattern is still essential, especially on the harder difficulties. The game’s difficulty is such that there’s options that make it accessible to those new to the series, but also provides more challenge to those that want it (Nightmare and Inferno modes). On higher difficulties, bosses will have slightly altered attack patterns, giving you something else to adapt to. Yes, the Double Boost’s HP recovery does help you last a bit longer, but not getting hit in the first place bolsters your longetivity far more since it only recovers so much of your HP, and the Spirit Necklace – which revives you when your HP is depleted – only works once and is expensive to purchase (the only time I bought one was for the final dungeon). Considering this is a port of a remake of a game that was released on nine consoles, it’s pretty hard to call this original. Sure, it took a game that garnered mixed reactions and revamped it into something with a different engine that was much better received. Plus, a good amount of of people probably wouldn’t have played the PC version due to it being released only in Japan, so this game will seem new to them. The fact remains that this is the PC game ported over to the PSP with a few additions. That doesn’t make it a bad game, it just won’t earn it high marks in originality. I really enjoyed my time with Oath in Felghana, and I was easily able to spend hours on it, even when I had to keep retrying a boss battle until I managed to get the hang of their attack pattern and how to counter it. The backtracking after getting a new item did get somewhat tedious at points, but it never got overbearing enough for me to want to put the game down. It’s not an exceptionally long game, which makes it conducive to multiple playthroughs. Even after I beat the game, I’d still pick up the game either for a quick run through Time Attack mode or for another playthrough on a different difficulty in order to unlock more items in the gallery and do quests I missed the first time around. The reaction to Ys III can be roughly be equated with what Zelda II got after its release: reviled for the huge departure it made from the other games in the series with the shift to a side scroller. Oath in Felghana managed to turn that around in its integration of Ark of Napishtim‘s engine and received a considerably better reception. Those who didn’t enjoy that game might not like this one given how similarly the two play. Since this is the first official release of Oath of Felghana outside of Japan, it should sell quite a few copies. The fact that XSEED is releasing three Ys ports on the PSP, all coming with a premium version containing extras somewhat akin to the ones a la Working Designs used to do should help the series gain more exposure, which it strongly deserves. Of course, it’s still a niche series, but if more releases like this keep coming, it may well earn more name recognition. 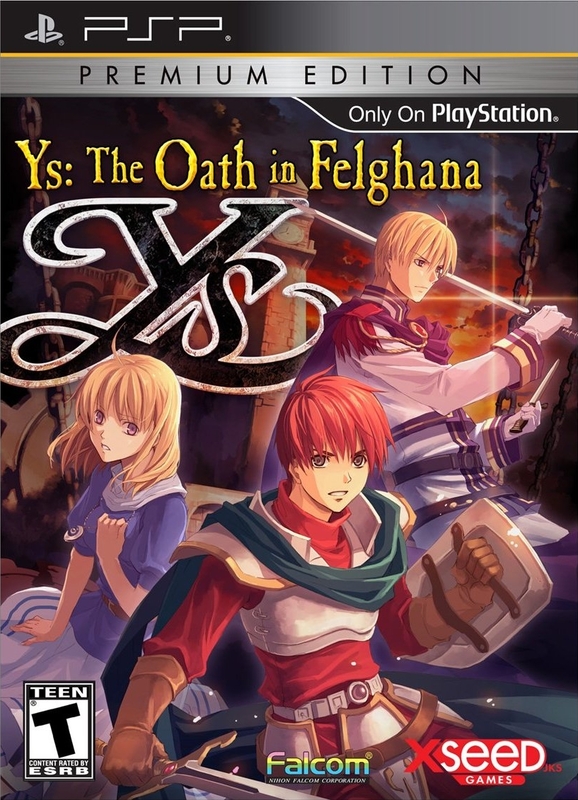 Ys: The Oath in Felghana is a fun action RPG with platforming in the vein of Ark of Napishtim. Like other games in the series, it has an amazing soundtrack, and the option to choose between three different versions of said soundtrack was a great inclusion. It’s obvious XSEED put a lot of love into the release, from the bonuses that come with the premium version to incorporating the fan translation to adding in the option to switch between soundtracks at will. Whether this is your first go with the game or if you’ve played the PC version to death, it’s still quite enjoyable, and the various difficulty options and the ability to lower the difficulty temporarily for a boss battle makes it both accessible to newer players and challenging to more experienced ones. One question: did they credit NightWolve? If only to take that Froot Loop off of the edge a bit. No, they didn’t. IIRC, NightWolve took care of the programming while Deuce did all the translation. Just what we need. Another thing to send that guy over the edge. Did you see his proposed DRM scheme? Wait, I don’t think I was completely clear. I meant that he did the programming for the PATCH, not for the official PSP release (at least, I can’t find any indication he was involved with the latter). And do you mean this (http://dis.4chan.org/read/games/1233693984)? Because that’s the closest I can find, and dang that’s a crazy scheme. That’s the one! Yeah, just more proof that the guy is bonkers. I know he programmed the patch. I just wish he’d have gotten SOME recognition from XSEED or Falcom for his work. His patch work was great, and without him, Deuce’s translation wouldn’t be well known. 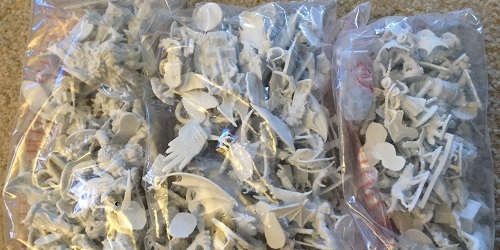 Not nearly enough so to be professionally used.